Ok, I have a new favorite paint color! You guys know I cling to my favorites for a while. 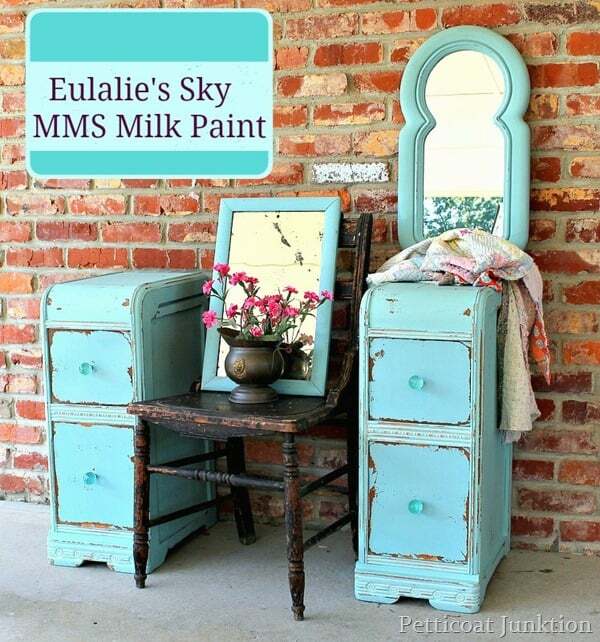 Eulalie’s Sky is one of 3 new milk paint colors from the Miss Mustard Seed’s Milk Paint line. I love the aqua/turquoise color. I have a hard time defining aqua and turquoise. The two colors are sometimes interchangeable to me. There are so many graduations and tones to the blue/green colors. This piece was very beat up. It used to be a vanity and someone took it apart. I purchased the two pieces at the Nashville Flea Market. For this project I used the Eulalie’s Sky MMS Milk Paint, the new MMS White Wax, and the MMS Bonding Agent. I was going to do a two-tone finish and use the MMS Ironstone but I decided against that. 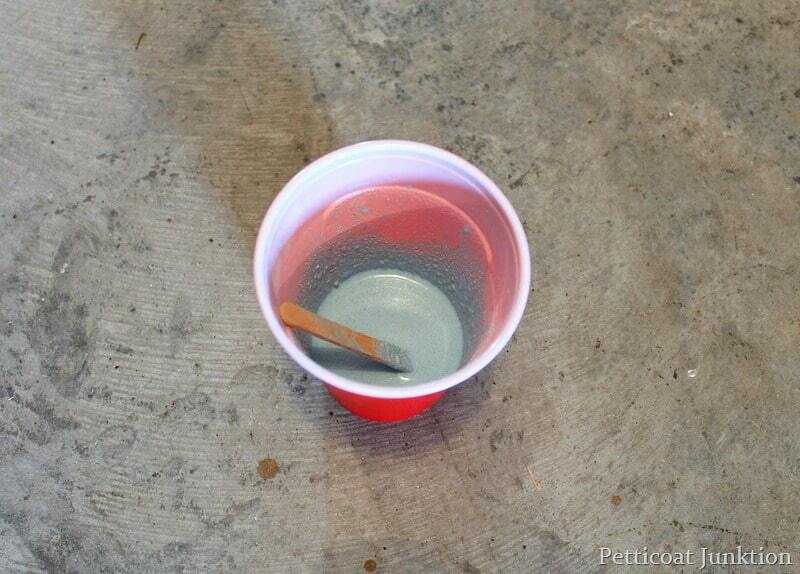 I mix the dry powder with water in a 1 to 1 ratio…equal parts of each. The paint will be thin. 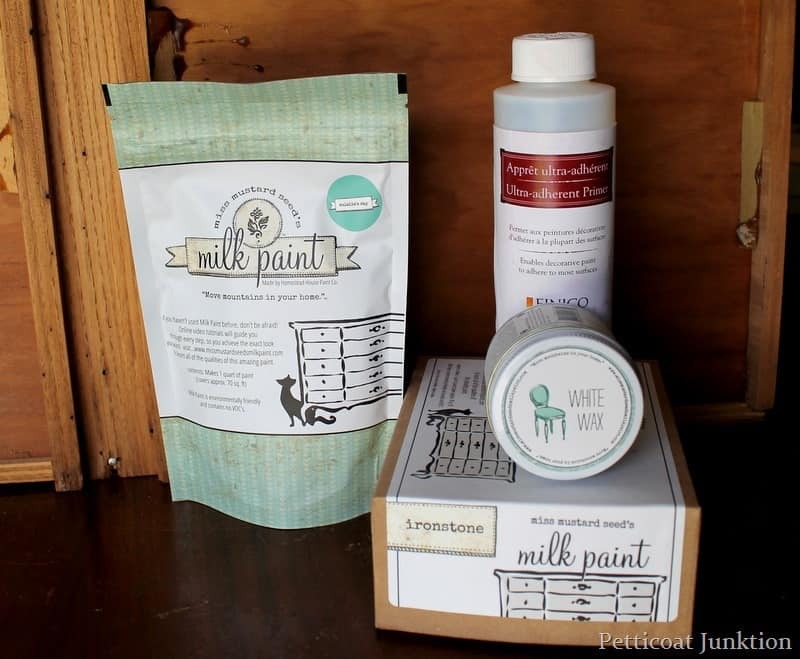 For more information on mixing and colors you may want to check out Miss Mustard Seed Milk Paint Projects and Painting Tips. Because the nightstands had missing veneer and patched places I decided to add the bonding agent to the milk paint. I knew the piece would not chip evenly because of the different finishes. Where the veneer was missing on the top I knew the milk paint would bond strongly to the raw wood and where the original finish was intact I knew it would chip. I wanted the look to be more cohesive. So I added the bonding agent and for the finishing touch…..distressed like heck with my electric sander! The mixed color and the paint before it dries is more blue than aqua/turquoise and I found that the sample color block on the package is a little darker than the actual color. It’s very hard to get a printed color the very same as the actual color. 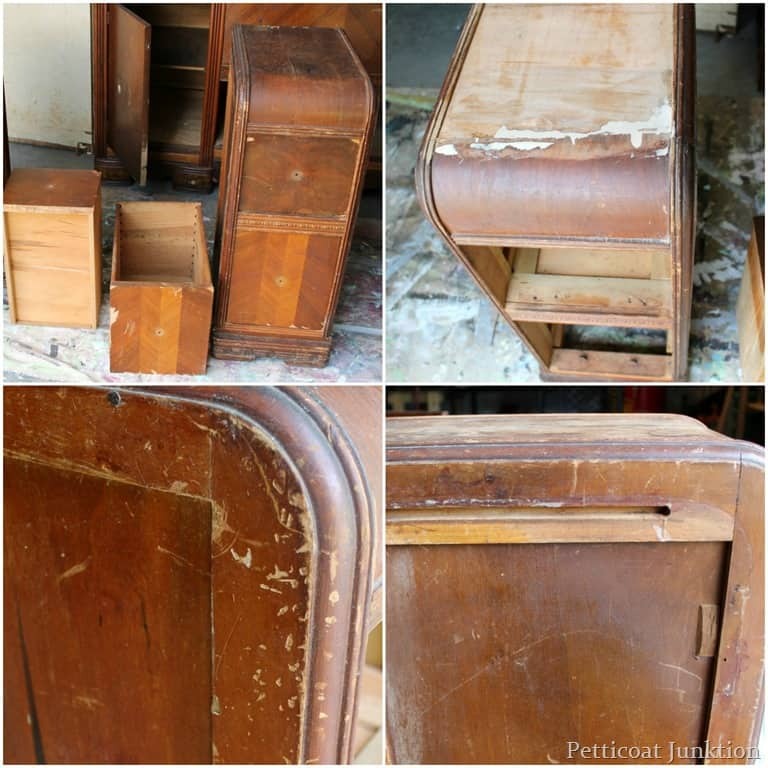 I used the white wax very lightly on the details between the drawers and on the bottom casing. I’m crazy about the new white wax. On the entire cabinet I used MMS Neutral Wax. And the knobs of course are from Hobby Lobby, my number one source for new knobs. I can’t believe they quit having them on sale every week. I’m telling you, for 2 years straight they were on sale. Now they’re on sale every other week. Did you guys know that? 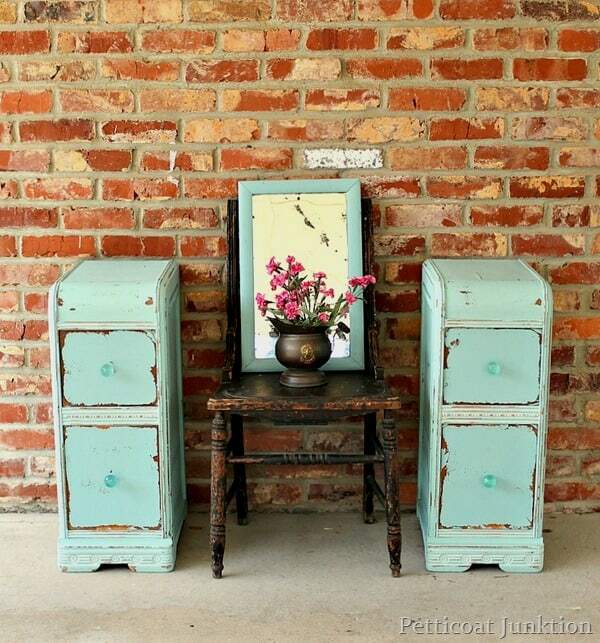 What do you think of the new milk paint color? Please share your thoughts, I love hearing from you. You can leave a comment below. What I love about your re-do is that you are taking old furniture that would have otherwise probably ended up in a dumpster and giving it new purpose. 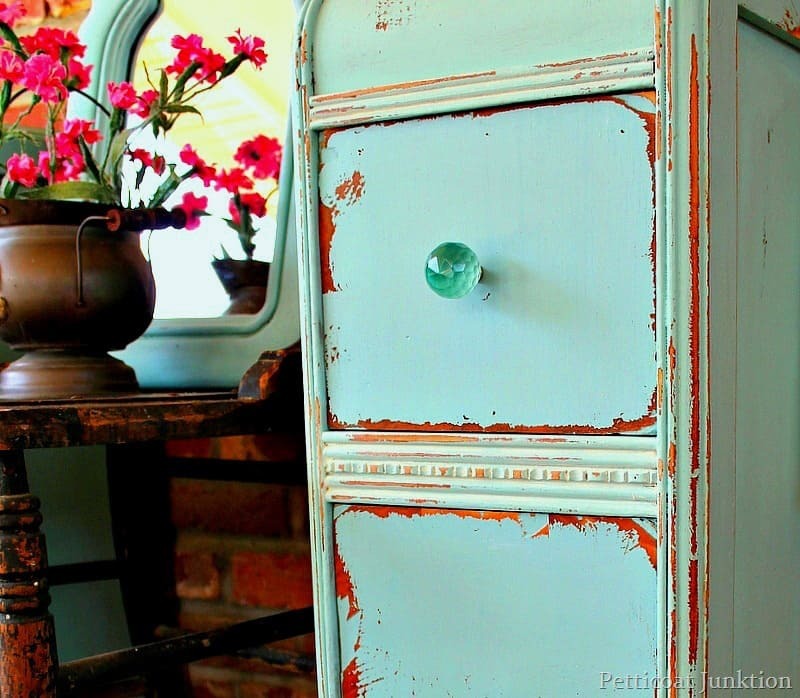 You are not destroying perfectly good vintage furniture in the quest to add color to your palette which sadly appears to be the trend. Thank you Lexa. I usually try to work with beat-up old pieces that need love. I love this new blue green color. It is perfect for a pair of end tables in my living room. My lamps are a deeper version of this color and it will be perfect. I have the same color in some art work in the room. I have paired it with a deep orange color in my curtains and accessories. Thank you for the inspiration! Like someone else above – we have just two tiny spaces on either side of our bed – something like this would work really well! I am so much a neutral color kind of girl – but this Eulalie’s Sky is really speaking to me! I may have to try it. . .
It’s a great color! I just started ‘playing’ with it myself. Words can’t describe how much I LOVE this!!!! I absolutely love this! You did a great job! Come Link Up with us tomorrow at Craft Frenzy Friday at http://www.craftdictator.com! Eulalies Sky is an absolutely beautiful shade. I might have to think about veering off from my primary color palette and using it. That is a great colour and your pieces look wonderful. I’m like you – I like a color – I use it ALOT. Right now I’m on a turquoise kick. But the other vendors will compliment me and then they’ll say – there are other colors out there – ha!!. I know about the Knobs at Hobby Lobby – I was in there buying 6 of them and the cashier goes – they are always half off – except for this week and I’m like NOOOOOO !!! So I put 4 of them back and then used my 40% coupon that I had printed off – just in case. LOVE this color! I have a major crush on all things aqua and turqouise, it doesn’t matter what you call it. I need to try some of the white wax. I used it in her Advances Painting class at Haven, but want to try it on a larger piece. I love the way it looks on this piece. Thanks for the inspiration! 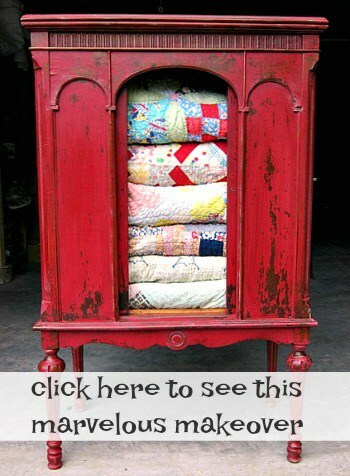 I love the way you separated the two drawer pieces…would be just right for nightstands! I need two just like that, we’ve got a small space on each side of our bed and have been using a wire table and a small side table. These would be awesome! I love it!! Love love the color! Aqua is my favorite color! I love this color. I have never used MMS milk paint. I have been reading up on it and I am still a bit nervous to use it on my pieces. I am afraid I won’t be able to work with it well. The cabinets you did came out really great!! Oh my Kathy, that is just dreamy. I just bought that color. Now I am for sure going to use it on a dresser. Love this color, also. I just purchased Eulalie and she is being stretched. congratulations on your purchase. 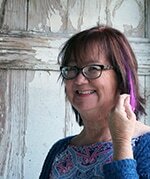 I love Eulalie….jealous!